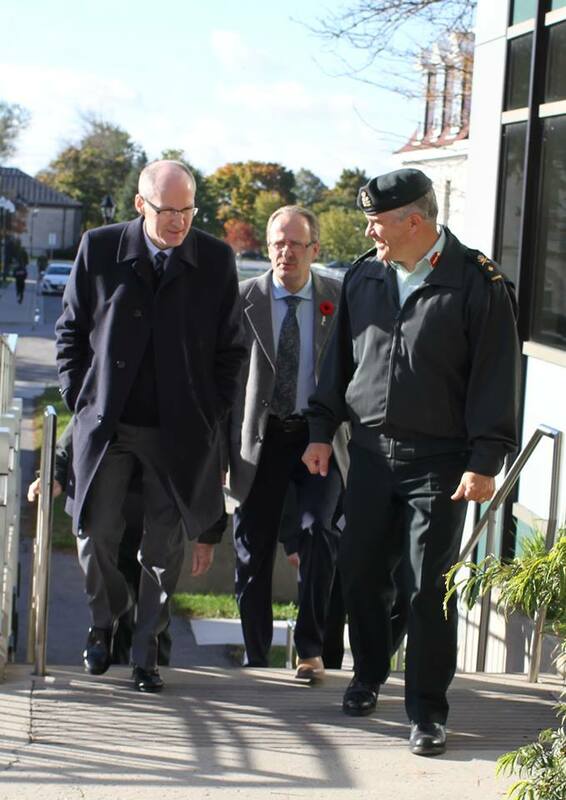 Mr. Gordon Venner, Associate Deputy Minister of National Defence (pictured left with RMC principal Dr. Harry Kowal and RMC commandant, BGen Sebastien Boucher – had a productive visit at RMC on Tuesday, 30 Oct. He met indigenous students of the Aboriginal Leadership Opportunity Year program and made a short presentation and led a discussion with a Political Science class. He also toured some of RMC’s engineering labs, including RMC’s SLOWPOKE-2 research nuclear reactor facility. M. Gordon Venner, sous-ministre délégué de la Défense nationale, a effectué une visite productive au CMR aujourd’hui. Il a rencontré des étudiants autochtones du Programme d’initiation au leadership à l’intention des Autochtones, fait une brève présentation et mené une discussion avec un cours de science politique. Il a également visité certains des laboratoires d’ingénierie du CMR, notamment l’installation du réacteur nucléaire de recherche SLOWPOKE-2 du CMR. 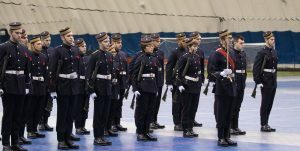 This past Sunday (October 28th, 2018), the Royal Military College of Canada held its annual drill competition. 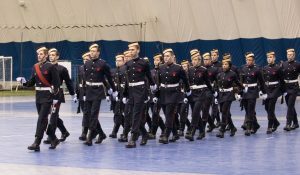 With over 800 Cadets present throughout the day, all twelve squadrons participated in hopes of achieving this year’s 1st Place spot. Consisting of two troops and a flag party, Cadets in the competition polished their boots and gators, picked up their C7’s, and put on a show. Each squadron seemed to be just as sharp as the next. 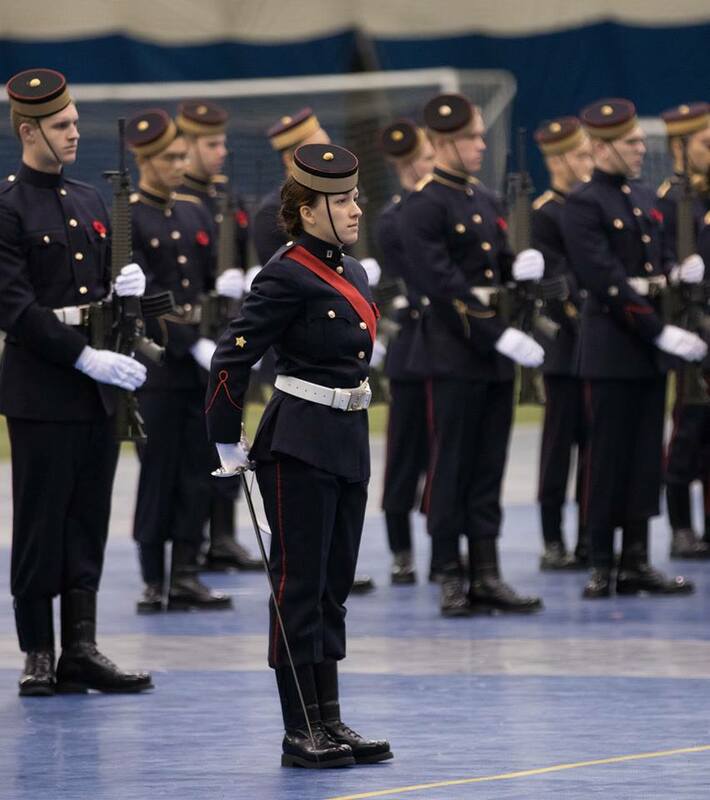 The format of the drill sequence followed that of a parade: The 2IC called on the troops, the CSL took over, the flag party marched on, an inspection took place, then it was all complete with a march past and advance in review order. When each squadron was done, they’d quickly get off the parade square and make room for the next one. 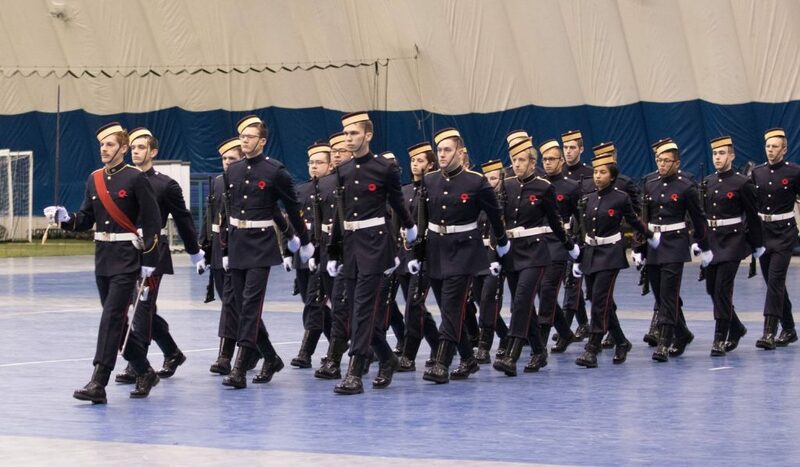 Despite the amazing turnout of Cadets and their stellar drill, there could only be one winner. 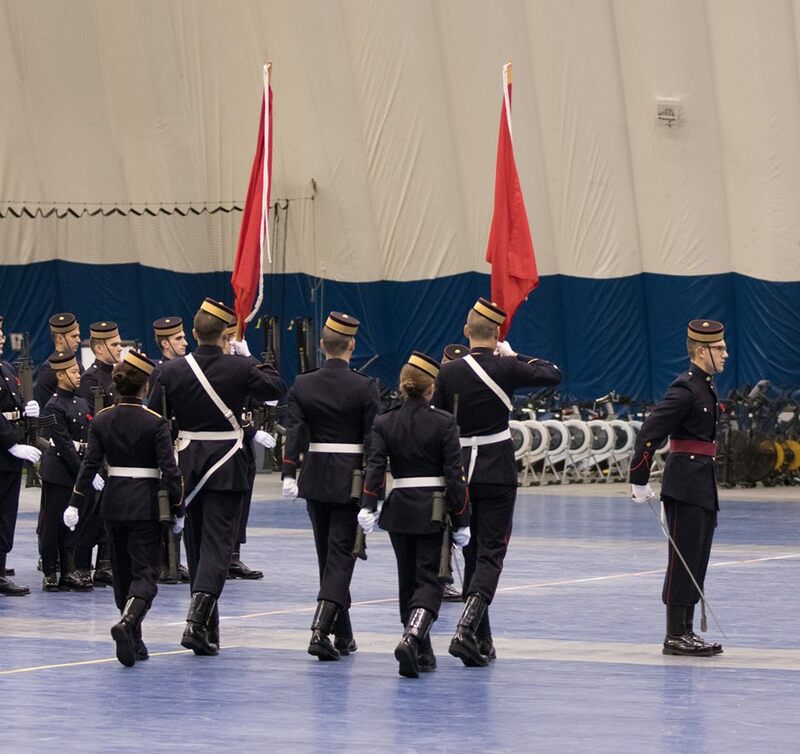 Soon after the drill competition, the results were announced with 10 Squadron coming in first with a score of 90 points, closely preceded by 11 Squadron in 2nd, and 12 Squadron in 3rd. For me, this competition was a neat experience. 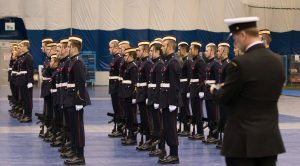 At RMC Saint-Jean, our drill competition was structured more like a strict show of drill capability with little room for flexibility. While it was extremely beneficial in its own way, it was interesting to see how each squadron did their own thing to stand out from the rest. 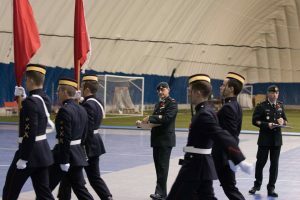 10 Squadron used their own flags for the flag party, some squadrons marched onto the competition area from the side, while others commenced right from the starting position. 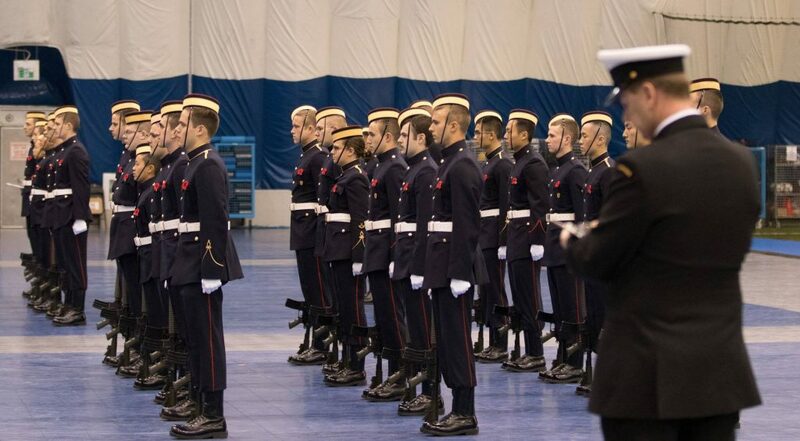 But there was one thing in common throughout the entire Cadet Wing: effort. It was clear to see that, regardless of what they were doing to set themselves apart, each squadron had put in significant amounts of effort and dedication. 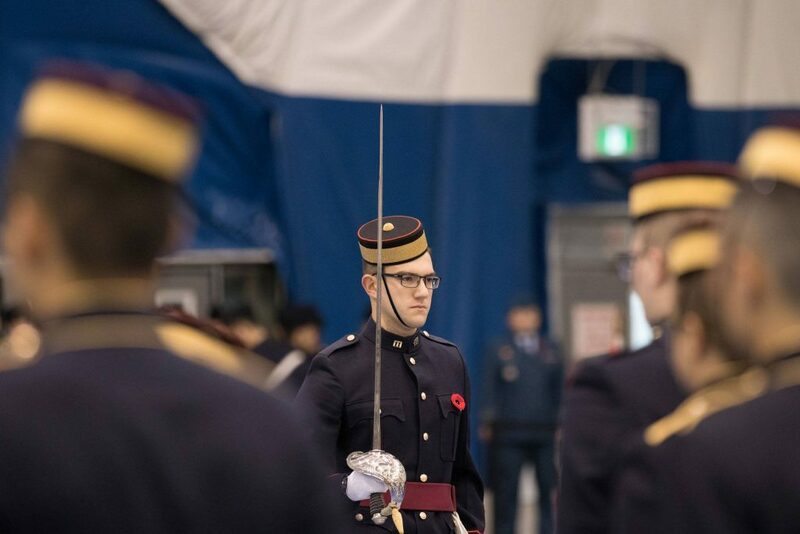 I think I can speak for everyone when I say that this past weekend was an excellent example and display of the pride the Cadets of RMC take in themselves and their personal standards. With the bar being set so high, it’ll be interesting to see if 10 Squadron can maintain their title at next year’s competition. This week’s PD discussed the importance of time management. All Divs attended the PD in the New Gym in and The Cadet Mess. The PD consisted of lectures about how to time manage effectively. The presenters viewed time managing a key factor when becoming an officer in the Canadian Armed Forces. An officer needs to manage his or her time effectively to ensure their operational readiness. Officers in the CAF are given problems and situations that can only be solved in little amount of time. It’s our job to use the minimal time given and to use it effectively. Videos were presented also about this topic. The videos described time is a resource and it should be used efficiently. Being an efficient officer requires strong time management skills. 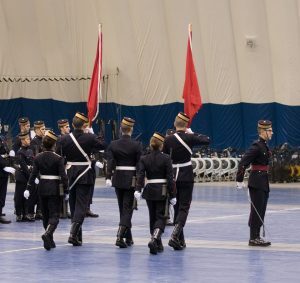 These skills are built through especially built through the college, such as completing assignments on time, meeting the standards that are set and allocating time for fitness. The presenters had given us a project to complete. The project was to place our selves in to groups of five and to create one group members schedule for the rest of the semester. One group had a science student who was on Sandhurst and the paintball club. We were to create this Cadet’s schedule on an hourly basis. 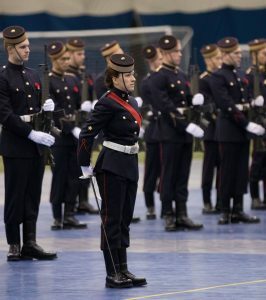 So, her Sandhurst commitment took her mornings away, waking up as early or even earlier than 5:30. before she went to breakfast and then classes for the rest of the day. She then had after school commitments which also involved more Sandhurst training and recreational activities. She then had study hours which all First Years have, followed by face check then “Lights Out”. This Speaker explained that this activity is what an effective time manager would do; they would plan out their day by the hour. This ensured that nothing would be forgotten and everything would be completed on time. In conclusion, this PD informed this First Years how to be a better planner and encouraged them to create a schedule by the hour to increase these skills that are required for an Officer in the Canadian Armed Forces. 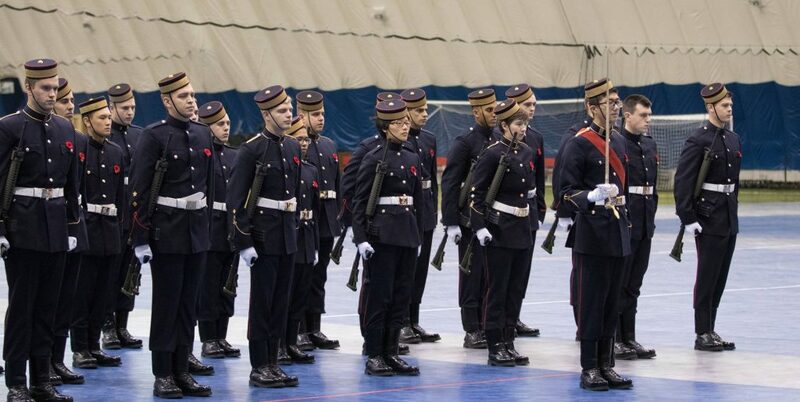 The PD of October 31st consisted of one hour of rifle drill for the Second Year cadets. Cadets learned the Recover Arms Reversed movement, a movement which is used mostly during cenotaph duty. With the Remembrance Day ceremony coming up on November 11th the training wing’s intention with the PD was pretty clear for all involved. This week, RMC’s Third Year cadets were presented with the resources available to them in order to initiate change at the College. The first presenter was the college’s Director of Plans and Strategy who provided an update on the state of the recommended changes from the Special Staff Assistance Visit (SSAV). Next was the project leader of RMC’s Success Center. His presentation was focused on how he and his team are available to ensure success, manage stress, and help problem solve. The final presentation was by a representative from CFB Kingston’s Integrated Conflict and Complaint Management Program. During this discussion, Third Years were introduced to the process of submitting a grievance. It was made clear that a grievance can be a useful tool to initiate change and improve the quality of life at the college. In all, RMC’s Third Years walked away from this week’s professional development brief with a greater understanding of how they can have an impact on their own life at RMC as well as an appreciation for how many resources are committed to their success and well-being. This week, the Fourth Year class participated in a drill lesson for professional development. 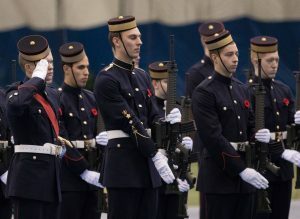 For many, it was their first exposure to sword drill and understanding the officers’ role on parade. In a few short months, knowledge of sword drill be important for the Fourth Years as they will be carrying swords on the Grad parade. This was a good learning opportunity and will prove beneficial by the time that practices for graduation begin. Dr. B Asks, "What are you reading?